Porsche has unveiled its all-new Boxster model which comes with styling changes, new engines and improved fuel economy. The new car has an all-new lightweight body, new flat-six engines with direct petrol injection and a completely revised chassis. It's lighter with a longer wheelbase and has a wider track to give better handling. There's also the addition of electro-mechanical power steering. Porsche says that all this, with the addition of larger wheels, significantly improves the handling of the car. Styling changes include shorter front and rear overhangs and a windscreen that's been shifted further forward. Overall the car has a flatter silhouette than the outgoing model. There's a new fully electric hood, which now dispenses with a compartment lid for the convertible top when stowed and Porshe says the interior design offers the driver and passenger more space, while the centre console, taken from the Carrera GT, further improves ergonomics. The line-up comprises the Boxster and Boxster S. Both derivatives are powered by flat-six engines with direct petrol injection but to improve fuel economy the German sports car maker has included electrical system recuperation, thermal management and stop/start. The standard Boxster has a new 2.7-litre engine that delivers 263bhp, which is 9bhp more than its larger-capacity predecessor. The Boxster S features a 3.4-litre which now delivers 313bhp - 4bhp more than before. Both versions feature a manual six-speed gearbox as standard, with the seven-speed dual-clutch automatic box available as an option. Fuel consumption for the BMW Z4 rival with the auto 'box is 36.7mpg, and 35.3mpg for the Boxster S, which is an improvement of 15% over the outgoing model. 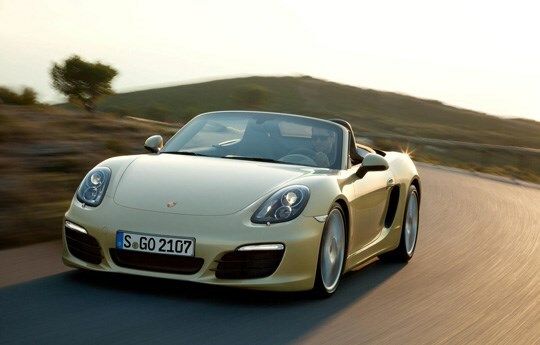 Acceleration is brisk: the Boxster sprints from 0-62mph in 5.7 seconds, the Boxster S in 5.0 seconds. Porsche's Sport Chrono Package option is offered, featuring Dynamic Transmission Mounts for the first time. Also new in the Boxster is the option of Porsche Torque Vectoring (PTV) with a mechanical rear limited slip differential. The Boxster features an Alcantara interior, 18-inch alloy wheels, stop/start and Sports mode, remote control hood operation, audio CD with seven-inch colour touch-screen control, a universal audio interface offering MP3 connectivity and a three-year warranty. 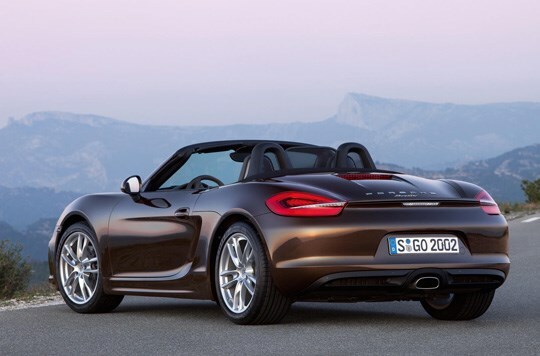 It will go on sale in the UK from April 28 priced from £37,589, while the Boxster S is priced from £45,384.